Today is a special Perfect Picture Book Friday. I quickly discovered that the books that leapt instantly to mind in this category (Beatrice’s Goat, One Hen, etc…) have already been expertly reviewed by others for previous PPBFs. So I chose a book for younger readers that shows a way of life very different from my own. I hope you like it as much as I do. Brief Synopsis: (From the jacket) The rhythm of the Tanzanian day inspires the melody of the evening’s lullaby in this sweet song of family life. Links To Resources: It’s important for children to learn about the world they live in, and understand that not everyone lives the same life they do. This book offers a wonderful opportunity for children to explore how things in their life compare to things in this book – ask, how are your clothes alike or different from the baby’s clothes? Does your home look like the homes in the book? How is it the same or different? Do you take a bath the same way the baby does? The baby’s father works on a fishing boat – what does your father do? The baby’s mother carries him in a sling on her back – how are babies carried where you live, or are they put in strollers or swings? This baby has monkeys and zebras nearby – what animals live near you? The story offers a great opportunity to talk about how life is the same everywhere on some levels, and yet very different on others. Why I Like This Book: The language in this book is rhythmic, soothing and beautiful – just like a lullaby. The story takes readers through a day in the life of a family on the shore of Lake Tanganyika in Tanzania. The gorgeous illustrations give a glimpse of what the scenery is like, how people dress, where they live, what they do. The story is not long – easily short enough for a very young child, but offers an idea of what life is like in another part of the world, perhaps very different from what the reader has experienced. This is a beautiful book, perfect for bedtime! PPBF bloggers, please leave your post-specific links in the list below. I’m really looking forward to reading everyone’s choices for Universal Children’s Day! “WHAT!” I heard you gasp. That’s it? The 2nd Annual Holiday Contest!!! I don't remember there being any dogs in this book (although there are zebras and monkeys) but I think you would like it anyway, Rhythm! 🙂 It's very lovely, and I bet some of those kids you read with would really like it. It has beautiful pictures and words. Isn't it though? Just wait until you see the inside! And as you know, I love anything Patricia MacLachlan writes – this is no exception! 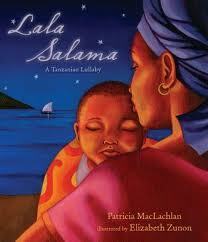 This book looks beautifully illustrated and I love Patricia MacLachlan, so it has to a winner! Will be keeping a lookout for this one! Thanks for sharing at Booknificent Thursday! See you next week!